Author Jim Collins in the book Good to Great says that the ability to get and keep the right people is what sets great companies apart from others. An open position at your company in today’s economy will likely yield a plethora of great-looking resumes and while you may be tempted to perform the hiring-process-as-usual to decide between your top candidates, now just might be the perfect time to upgrade your workforce to include the very best available talent. Today’s job market means the available talent pool is deep and power rests squarely in the hands of employers. As such, smart companies are thinking strategically about how to expand their talent today and build a competitive advantage for tomorrow. After all, many predict that the battle for talent will soon return. Of course, hiring the right people depends on a well-devised employee selection process that results in hiring those who will enable you to compete and retaining those that give you an edge. Employment screening and background checks play a vital role in this process. Background checks take a high level of subjectivity out of the decision making process and provide valuable objective information upon which employers can make informed hiring choices. Now, if you’re like 80% of corporate America, you are probably already conducting background checks on your candidates and employees. And that’s great. But when you’re looking at upgrading your workforce, there’s likely something more you can (and should) be doing. 1. 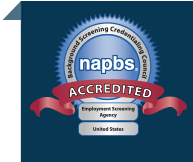 When was the last time you performed a critical review of your employment screening program? 2. Do you view employment background checks as a way to “check the box” or do you see background screening as a strategic part of the hiring process? 3. Are you taking advantage of this “down time” to review the practices that will enable you to compete when hiring heats back up? Employers who view today’s talent pool as an opportunity to build their “bank” of human capital will ensure their screening program supports their business objectives and will strive to create a program that offers true value in the employee selection process. Employee risk assessments to ensure decisions made on the basis of a background check are aligned with the risk and responsibilities of the job. Employee reference checks using our Tru-View automated reference checking system that takes the hassle out of reference checking while giving you higher quality feedback from people who have firsthand experience with your prospective employee. National criminal background checks to further guide local/county court records searches and uncover potential criminal activity that may have occurred in jurisdictions away from where your applicant has lived. Driving records check to gain clues about an individual’s degree of self control, ability to learn from mistakes, potential drug or alcohol issues, and more. Civil court records check to elicit information about noncriminal behavior such as lawsuits between individuals, lawsuits between businesses or business partners, suits between creditors and debtors, and worker’s compensation cases related to your applicant. Social (and other) media background checks to gather information about incidents that may not be reflected in official records. For example, you may want to know if your applicant has written a scornful letter to the editor. Or perhaps the individual you’re ready to hire has been unfavorably portrayed in the news. Or maybe it’s important to know how your applicant behaves on Facebook and other social media sites. Media background checks can give you this information. The fact is, for every dollar an employer invests in employment screening, the return on investment ranges from $5-16, resulting from improved productivity, reduced absenteeism, lower turnover – and decreased employer liability (according to the US Small Business Administration). We believe an investment in talent today will yield even higher returns for the future. If you need help using employment background checks to upgrade your workforce, let us help.